What is GPA. How is it calculated? Compare your GPA to US equivalent. GPA means Grade Point Average. The GPA is a system of judging a student's performance and is followed throughout the United States. If a student seeking admission to graduate studies has grades in a different system he/she should clearly mention that GPA system does not exist and provide details on the system. In the event of a system different from the usual GPA system, some universities may ask for a detailed method of evaluation of the scores with their scales. In such case consult the Registrar or the controller of examination of the University for an official evaluation to be included along with the transcripts. It is recommended to send your rank certificate/official average score of class/toppers grades etc. to ease the difference between GPA and your system. GPA is one of the most important factors to get admission in a good college. Higher GPA with above average GRE/SAT score can get you into top 50 College. Class rank can get you in a top 20 college. GPA is a clear indication of your academic record (it shows you have the ability to perform well in academics, no other score can give a better indication of your academics). As we all know General GRE/SAT doesn't test your academics (though people with high score have a good chance that they did well in academics too but it's not true especially for students outside the US). Class Rank/GPA is quite critical for international students. Try to make table of your University system and GPA system. 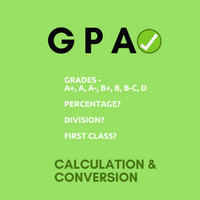 Show the comparison between GPA and your System and get it sealed with University registrar and send it along with transcripts. You can also use the print of below URLs. US Equivalent 3/4 (B) used by Universities for some Countries. Most US universities have a minimum Undergraduate GPA requirement of at least 3/4 for admission to graduate program. The minimum requirement for PhD. is much more than 3/4. But evaluation of GPA might vary for international students. Also, GPA is not the only criteria for admission we have seen students getting admission in top universities with low GPA. We saw in a lot of cases where students get admission in graduate school with less GPA of less than 3/4. Your chances of getting into top university will reduce, but you will get admission in some college (Many International students have this question: "My GPA is <3/4 should I even consider applying to American University?"